Last week was a very media-busy time for people being rescued from the New Zealand back-country. That time of year again, perhaps? Just a general kind’a day when the weather’s not so happy. This eventful day, where our actions were strongly influenced by conditions, was the 27th of June 2010, near McKinnon Hut in the Ruahines. 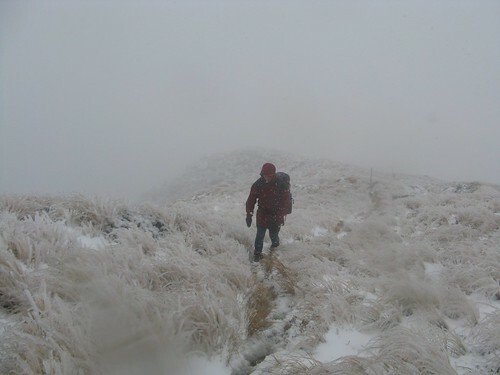 23rd July 2011: A couple of people were rescued having spent “a week” stuck at Kime Hut (Tararuas). If you read past the inexplicably incorrect headlines whose authors seemed to ignore the text of the articles, the more correct version of the story is that they left home on Tuesday and were collected on Saturday (4 nights). Asking around further, it turns out that they were really only stranded at Kime at all for the last three nights (two of them unplanned) prior to being walked out by a SAR team. Still very unenviable and risky circumstances, but the media seems to have been over-hyped, maybe encouraged by a highly publicised (and less happily-ending) incident near Kime Hut a couple of years ago. 24th July 2011: A group of kayakers spent an unplanned night near Tauranga, having run out of daylight. Two girls were airlifted out on Sunday morning whilst the remaining two men paddled their way out. 24th July 2011: Three men who were out pig-hunting in Marlborough got lost, spent a night outside, and were collected by a helicopter. 25th July 2011: Two trampers were rescued from Cass Saddle, in Cragieburn Forest Park near Arthur’s Pass at 10am, having spent a freezing night in the open and then been stuck in the small Lagoon Saddle Shelter for three additional nights. Graeme Kates, who publishes records of incidents near Arthur’s Pass, notes that flying conditions were marginal, it took two attempts to reach them, and walk-in LandSAR teams were on standby in case flying turned out to be impossible. I’ll get to this one later. 25th July 2011: A young 17 year old hunter became lost, separated from his father, and spent a freezing night outside between Opotiki and Gisbourne. An overnight search failed to find him, but he was located at 8am and air-lifted out by a helicopter. 27th July 2011: A small Alpine Cliff Rescue team spent a cold night on Mount Taranaki having shown up at 10.30pm, after a 90 minute walk from a helicopter drop, to rescue a stranded and disoriented snowboarder. The man was flown out, but deteriorating weather meant the rescue team was left on the mountain until the following day in a night they described as one of the worst they’d ever had. 30th July 2011: An injured 13-year-old tramper was collected from Nelson Lakes, between Speargrass and Angelus Huts, after he fell about 1 or 1.5 metres. There will have been other call-outs during the same time-frame which haven’t been reported. That last one, which involved an injury evacuation, occurred several days later and I just threw in for show. Out of all of these media reports that describe distinctly different incidents, the 30th July incident was the first to describe a rescue from a situation that probably couldn’t have been easily prevented. The rest all involved bad judgements or decisions, and people losing awareness of where they were. In short, big storms sweep the country and many people who are unfamiliar with the conditions make mistakes. I think it’s great to go out when there’s stormy weather, for all sorts of reasons. Sometimes I only notice it once I’m back, but I appreciate seeing places in ways that many people simply don’t see them, plus it can help to gain and retain familiarity and a better appreciation of what the environment can really be like when it’s not playing nicely, as well as how to cope with it. That said, stormy weather presents new risks and challenges that need to be managed very carefully. Decisions need to be taken with great care, and that’s a separate issue which I wrote about some time back in a post titled The Next Three Hours. I’m fortunate that I’ve been able to build up a collection of friends whom I trust my life with and learn from. In my case it’s been through my association with the Wellington Tramping & Mountaineering Club. With this post, however, I wanted to focus on the 25th of July rescue near Arthur’s Pass, listed as the fourth bullet point above. This incident stands out not for the fact that two people made some unfortunate mistakes, or that they were described as “experienced”. People who make mistakes are often experienced just as people who drive badly have sometimes been driving for 40 years—I don’t think there’s a correlation between experience and safe practices. Of more relevance, the Police Sergeant in charge of the rescue has been quoted on the record as saying “This is a classic example of how incidents like this can be resolved successfully, due to the missing party observing the cardinal rules of back-country travel.” As I read that, he seems to be implying they did everything right. Apparently things just went badly for them, at least according to the quote which (let’s be clear) may have been presented out of context. Really though, I think if they’d done everything right then they’d likely not have needed rescuing. Mary: An experienced tramper who was stranded for three days with his wife in Canterbury’s high country in freezing weather will lose his big toe to frostbite. Chris [surname] and his wife, Sally, set out for a two night tramp in the Cragieburn area near Arthur’s Pass last Wednesday, but the couple encountered heavy snow and had to survive a night outside as well as two nights in a small hut before they were rescued by a helicopter yesterday. Mary: Did you not realise how bad the weather might be? Chris: It wasn’t the weather that Christchurch and the coast was subjected to that was the problem. We were aware of the southerly coming in on the midnight of the day we went tramping. You see, we’ve experienced winter tramping before. We drove out and found no problem with the roads, the weather was good when we got to the start of the track. It was sunny, clear of snow, beautiful blue skies, but when we had gone a couple of kilometres along the flat, and then started ascending. Then we met the snow, and it got deeper and deeper and deeper, but because we had done this tramp twice before, we were familiar with the route and we felt that so long as the snow was probably patchy we would be able to manage it. Mary: So you didn’t realise how much had already fallen? Chris: Exactly. Yeah, that was the issue. The snow in Christchurch was just something that we discovered later, really. It could have affected the rescue, of course, if the helicopter had not been able to get out, but it did. Mary: Spending the night outside sounds pretty grim. Tell us about that. Chris: Yes well what had happened was we were on route from the first hut that we stayed at, Hamilton Hut, thinking that the journey should be about four and a half hours to the next shelter where we were actually stranded, and then a couple of hours… two and a half hours down to the exit, but what happened was the snow was so bad that we got caught and the problem was then that we got lost in the dark and we had to go down to the river and follow it because we knew according to the map that the river would lead to the shelter, and by wading through the river, of course, and in glacial conditions, it was really terrible. We were climbing over icy blocks, boulders, snow fallen trees, logs in the river, all manner of obstacles. We got very wet, very cold, and then because it was about eight o’clock at night, decided we were not getting to our destination that night. We’d have to sleep out, and so we managed to get higher up to a reasonably flat spot amongst the trees, on the snow of course, put our packs down, put our plastic survival bag on top, put our sleeping bags in that, and squashed ourselves like sardines in there and tried to survive the night. Mary: What was it like? Chris: It was terrible, it was. You get very stiff, you want to move but you move and you just, your partner, virtually impossible to turn around but we did. If there’s ever a synchronised sleeping bag event in the Olympics, we’d be winners, I’m sure. Mary: Were you starting to get hypothermic? Chris: Well if that means, sort of slightly losing your mind, no I’d say not, but we were very very cold, and we thanked the light for finally dawning on us the next morning. But everything was frozen. Things that had been wet through the river the night before were solid, like boots for example. I could not get my boots on again. My gloves were just frozen ice blocks. Mary: So, Chris, what did you continue tramping in, then? Chris: I happened to have, well you described me as an experienced tramper, and we take things that we need like extra dry things. I had some trainer shoes, which I put on and I had just a thin pair of socks because I’d been through my two pairs of tramping socks. Mary: Did you ever think you weren’t going to make it? Chris: Oh yes, oh for sure. When we got to the shelter, we had not the two nights that you described, but in fact Friday night, Saturday night, Sunday night, and we used up all of our gas for heating up any liquids. Now liquids, of course, were formed by melting snow. There was no water. The hut purely had a bench to sit on, and some thin rubber mats that we put on the floor and huddled up in sleeping bags side by side to get warm. Mary: What was it like seeing the rescue guys eventually? Chris: Just, I’m not one who gets overly emotional, but even I burst into tears. It was such a relief. Yes, with no food left we’d spent the previous two days on just simply one pack of noodles per day. Initially we had a cup of soup each, but after that it’s just a pack of noodles, pack of noodles, and that was the entire meal for the day. Mary: All-right, quick question, Chris. Would you ever go winter tramping again? Chris: …at the time, my wife said probably our tramping days are over, but rationalising it I think our winter tramping days will never occur again. It’ll be summer time. Mary: Good to hear, good to hear, thanks very much. That is Chris [surname] who has survived five days in freezing weather in Canterbury. Given detail, there’s no doubt that these people took some good steps in the immediate circumstances having discovered they were in trouble. They identified a shelter on a map, they thought clearly enough to realise that despite not knowing precisely where they were, they could still follow a river to a known place. They budgeted their available food and resources to make what they had last as long as they could, and they’d left their intentions so that having eventually been reported overdue the search teams knew roughly where to look for them. Finally, when they were stuck outside in the freezing cold with no shelter whatsoever, they put their sleeping bags inside their one and only only plastic pack liner/survival bag, which was all they really had, to keep them dry. Despite demonstrating good reactions in the circumstances, the narrative above also reads as an account of initially mis-judging the weather and conditions, continuing to do so during the trip even whilst realising that conditions were unfamiliar, and then not being prepared for the unexpected when it befell them. All of this combined to create the situation in which they found themselves. I did stop to wonder how this situation might have turned out if they’d had a reasonable tent to match the conditions. It wasn’t mentioned, and I presume there was no tent or anything similar, which is a shame because a tent likely could have kept them warm and dry for as long as they needed it. They seem to have done the same thing that many complacent people do outdoors in New Zealand, which was to completely rely on back-country huts and neglect to take any useful form of portable shelter. I wrote much more about this issue in a post titled The Hut Fallacy. It’s sadly common for people to leave portable shelter behind, but it’s also a very risky thing to do in New Zealand, no matter what the conditions and irrespective of the scattered presence of back-country huts and the blind intentions people have of always reaching them just because it seems like a good idea for things to work out. Without such shelter, it really only takes a single mistake or misfortune to find one-self completely at the mercy of the weather. Over those few nights, all over New Zealand, at least 10 people were reported to have found themselves stuck out in the open without having been prepared. It would have been 11 if not for the Alpine Cliff Rescue team that located, walked for 90 minutes through deep snow, and eventually evacuated a lost snowboarder on the side of Mount Taranaki. Although the man was whisked away in a helicopter late in the evening, deteriorating weather meant that the 3 rescuers were left on the mountain. People die in these circumstances. It’s not an uncommon thing, and if the dice fell differently then those few days might have had a significant death toll. Those people were extremely lucky that the weather didn’t do anything worse than keep them cold until morning. This will always happen, of course. People make mistakes all the time, frequently under the radar and in ways that nobody but themselves ever realises. I’m certainly no exception when it comes to making mistakes, though I do my best to try and think carefully about what happened when I recognise them. Ideally as many people as possible will constructively learn from their own mistakes as much as from other people’s. What gets me with this specific case at Arthur’s Pass, however, is the way that these factors about decisions and preparation weren’t publicly questioned or even mentioned by the party themselves, by any of the media, or (apparently) by the Police Sergeant who ran the rescue and was then quoted to suggest that they’d done everything correctly. I don’t think it’s necessary to stick people’s heads on pikes or otherwise embarrass them when criticising mistakes, and I’m not trying to point fingers. I may be the next person to screw up in public, but I hope not. It’s important to acknowledge mistakes, however. Not acknowledging a combination of avoidable mistakes, and indeed presenting such an incident as if it was a perfect execution of safety rules, broadcasts an impression that this was an unfortunate coalescence of uncontrollable events whose greatest significance was a vicious battle with the elements and a tale of survival. It doesn’t convey that this would have been avoidable with better preparation, care and decisions, and it doesn’t do justice to all the people who go to lengths to be safe and not require rescue. It also doesn’t help to inform the general public that it’s possible to be safe in the outdoors despite unfortunate weather, and that discourages people from visiting and appreciating the outdoors. This entry was posted in article and tagged article, link propagation, media, news, search and rescue, tramping. Bookmark the permalink. When I read of the 17 year old lad missing overnight it certainly brought home a few memories of my own recent experience with my own then 17 year old son. The one positive thought I held onto that lonely night in the hut while my son was out there on a mountain river on a cold winter night was knowing what gear he had with him, particularly the bivvy sack and lots of food. I think anyone venturing out in winter should literally take double precaution. An extra gas cannister or two and a few days ration of food is worth the wait, and to not carry some type of emergency shelter is almost criminal. Even on day trips I carry a bit more food than I need and a two person Bothy Bag. Winter is a wonderful time to be out in our wilderness and mountains, just that a little extra thought, preparation, and respect for how fast things can change is called for. I meant weight, not wait 🙂 – but having written that if you get stuck and have to wait, it is worth having a little extra weight. Hi Robb. Thanks for the thoughts as always — all good points. I’m also usually a stickler for always having my own shelter directly with me, one way or another. Even in a group environment, I like to be the person with the tent fly, often not hard because most people hate that if they can get out of it. These days if I can’t pull it off, I’ll still throw in a bivvy bag just in case I get separated. I sometimes find that I’ll use it regardless if it’s a nice night to bivvy out. I hadn’t heard of a Bothy Bag until I googled it just now after reading your comment, and found this video. That must be a nifty thing to have around sometimes if you just want to sit down and have lunch out of the elements during the day. I ordered mine thru an outfit down in Christchurch years ago (Marvelox) if I recall correctly. Same one as in the video, and it has come in handy a few times in the rain and cold – with two people it is stretched very tight and you simply lean back, very snug, but produces a warm microclimate very quickly. I recall a winters day arriving back at Top Maropea from Wakelings on my own in a snowstorm and in the hut crawling inside my sleeping bag and huddling in the Bothy till I warmed up. All in all a good investment, and handy to know is in the pack. Certainly not a long term solution, but in a pinch will get you out of the elements. Taylor had my Fairy Down gore-tex bivvy bag, which is very good but a bit bulkier and heavier than the Bothy. Can you fit more than two in there comfortably? Or is it designed with two ends to lean against each other? The one I have is designed for two, leaning back against each end facing one another, the bottom has a “seat” that each person can sit on and the middle is the opening. Be hard pressed to get more than two, though an adult and two kids would be feasible, but I have been in it with my pack on one end quite content, while having a warm up rest or bite to eat out of the elements. They do make the sacks for up to 6 or 8, and they are apparently very common in the highlands of Scotland and England, so that would make sense for a larger group.